A family history research is never complete: every solved problem provokes two new ones; there are always new traces to be followed. But once one should dare to close the issue. Searching for the prime stock from which the Dutch Bruijnsteen's and Bruijnesteijn's descended, I accomplished a thourough research about the Brun- and Braunsteins, mainly in the German language area. After 13 years of intensive research it got clear which (German) family was the one in question, and all the further collected data (about 27 stocks !) became in fact superfluous. So I decided to a final publication of all gathered information as complete and as comprehensive as possible. It took two more years to search for some completing data and to write and compile the definitive text. 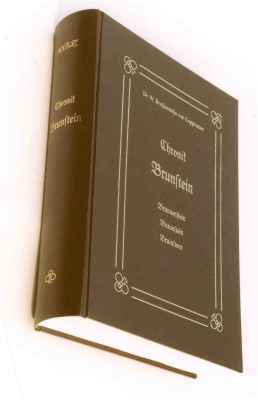 912 densely printed pages with the history of the Brun- and Braunsteins from medieval up to recent times. It is a bible of 21×30 cm2 (A4), 58 mm thick, bound in dark brown imitation leather with gold embossing. ISBN 90-802962-2-8. A name index with 12,557 entries is added. It is emphasized: the book is not meant to be recreative reading, but is a scientific exposition of the research results. Because the great majority of the Br(a)unstein descendents is German, the main text is in the German language (the chapters Copenhagen and Alsace are bilingual: German/Danish resp. German/French), but the numerous source citations are in the original languages of the documents, usually Old-German or Latin. All sources (original documents and literature) are - as far as possible - literally cited and interpreted in a scientific way. Because of copyright regulations concerning the many cited sources, this chronicle cannot be a free publication: it can only be delivered to Br(a)unsteins and their relatives. The original book version of the chronicle was available for  100, but is sold out. There is however now a version on CD-Rom too. 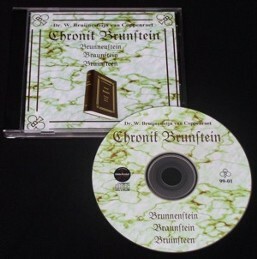 The CD contains the original text of the complete work, but some printing errors have been corrected, some pictures are improved, and a sound track of the Hans Christian polka by C. Braunstein (1838-1893) has been added. The CD-Rom costs  60 (incl. postage). Unlike about the printed book, some profit is included as a contribution in the enormeous costs of the research work. However, people registrated as buyers of the original book, can in addition obtain the CD-Rom for only  16 (approx. US$ 16). Who is interested please contact me by e-mail (address under the navigator, on the left of your screen). As stipulated already, the intention was to stop now further research on foreign (= not-Dutch) Br(a)unsteins. But of course I cannot ignore corrections and additions, which will surely reach me. So a page of this web site is provided for that purpose, which you reach by means of the navigator on the left of your screen, under Ergänzungen. A special position among the Br(a)unsteins is taken by the Jewish families. The earliest reports about them are found in the Romanian-Ukrainian border region. Because these people hardly turn up in the German language area, they have drawn my attention only in the last stage of my research. Consequently they are poorly treated in the chronicle. It has been found however, that the big majority of the present-day Brun- and Braunsteins in the new world (being thousands of them !) belong just to these families, so that they form now the greatest stock..
That was a reason to give them special attention in this web site. You find the concerning page by means of the navigator under Jewish stock. I call on alle Jewish Br(a)unsteins for help to develop this page.